Our SEACAMP I marine science program is a 6 day, 5 night residential summer camp for students entering 7th through 12th grade in the upcoming fall and is limited to 52 students per session. SEACAMP I is the first program in our progressive overnight Summer Camp options. 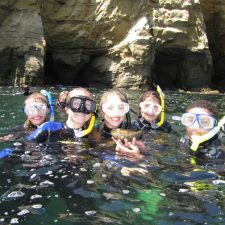 SEACAMP I overnight summer camp programs are designed to give students a broad knowledge base of all aspects of marine biology through hands-on education and interactive water activities. Students will cover a wide variety of marine biology topics in our labs and workshops, including fish adaptions, marine mammals, shark ecology, plankton evaluation and much more. Instructors will use our aquariums along with live and preserved marine animals to provide students with an in-depth understanding of the ocean and the animals in it. The topics covered in our labs and workshops are reinforced and applied in field activities. During the field activities, students will have the opportunity to observe and explore animals and environments that were discussed in labs. Students will be in or on the water almost every day – snorkeling, kayaking, stand up paddle boarding, boogie boarding and the highlight of the week, an all-day boat trip with snorkel excursion. Our goal is to combine hands-on labs with interactive water activities to give students a well-rounded experience. SEACAMP I residential summer camp is an excellent way to introduce students to the marine environment and marine biology. We engage those students who are already interested in Marine Science as well as spark the interest of those with little previous exposure. In most sessions, students will be split into two groups by age/grade with older students in one group and younger students in the other group. Additionally, all of our SEACAMP II sessions have a SEACAMP I prior to them which allows students 8th grade through 12th grade to attend SEACAMP I & II consecutively. Our overnight summer camps are designed as a progressive program – first attending SEACAMP I, then SEACAMP II and SEACAMP III – as all labs and field activities build on what was learned and accomplished in the previous residential camp session. Our SEACAMP I marine science program is a 6 day, 5 night residential summer camp for students entering 7th through 12th grade in the upcoming fall. Our goal in SEACAMP I is to combine hands-on marine biology labs with interactive water activities to give students a well-rounded summer camp experience. 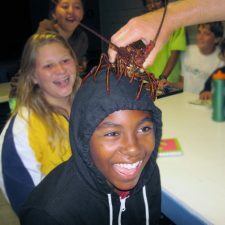 SEACAMP I residential summer camp is an excellent way to introduce students to the marine environment and marine biology. We engage those students who are already interested in Marine Science as well as spark the interest of those with little previous exposure. Students will cover a wide variety of marine biology topics in our labs and workshops, including fish adaptions, marine mammals, shark ecology, plankton evaluation and much more. The topics covered in our labs and workshops are reinforced and applied in field activities. During the field activities, students will have the opportunity to observe and explore animals and environments that were discussed in labs. In most SEACAMP I sessions, students will be split into two groups by age/grade with older students in one group and younger students in the other group. Overnight summer camp open to students entering 7th through 12th grade in the upcoming fall and is limited to 52 students per session. *This session may be done consecutively with SEACAMP II June 21 – 27, 2019. Students stay with SEACAMP from the start of SEACAMP I to the end of SEACAMP II. *This session may be done consecutively with SEACAMP II July 12 – 18, 2019. Students stay with SEACAMP from the start of SEACAMP I to the end of SEACAMP II. *This SEACAMP I session can be done consecutively with SEACAMP II July 26 – August 1, 2019. Students stay with SEACAMP from the start of SEACAMP I to the end of SEACAMP II. Enrollment is accepted on a first come, first served basis and is open until the start of the session date, providing space is available. A partially refundable $300.00 deposit is required to secure student’s spot in session. Students 8th grade or older have the option to attend SEACAMP I & II consecutively, giving students the option to stay with us for two weeks! Sessions indicated with (*) may be done with the next level. Students will stay with SEACAMP from the start of SEACAMP I to the end of SEACAMP II. $895.00 per student. At enrollment a $300.00 deposit or a full tuition is due. The balance of tuition and required paperwork including travel information are due on or before May 15th. Housing, meals, admission to all attractions, gear, equipment, 24-hour supervision and transportation while in San Diego, plus a SEACAMP T-shirt and water bottle. As an added benefit to those who are attending back-to-back sessions of SEACAMP I and SEACAMP II, your tuition will include all intersession activities, supervision, housing, dinner and breakfast. Transportation to San Diego is not included in tuition. Students and families are responsible arranging travel. SEACAMP does include transportation to and from the San Diego International Airport in tuition; however, flights must arrive and depart inside the given window of time and students must be traveling as a regular passenger (not classified by the airline as an Unaccompanied Minor). Deposit and tuition may be partially refundable. Cancellations prior to January 31st are subject to a $100.00 cancellation fee. Cancellations between February 1st & March 31st are subject to a $200.00 cancellation fee. Cancellations between April 1st and May 15th are subject to a $300.00 cancellation fee. Deposits and tuition are non-refundable after May 15th. Travel and unaccompanied minor fees are refundable up to 30 days prior to session date. Cancellations must be submitted in writing and received by the dates stated above to seacamp@seacamp.com. Cancellation Policy applies to each session. Students participate a variety of activities – each day is different and includes a combination of labs and field activities that are chosen to maximize time and provide students with a one of a kind experience. To accommodate age ranges and education levels students are split into two groups by age/grade with older students in one group and younger students in the other group. Students will do almost all of their activities with their respective age groups. Students enjoy a hot breakfast at camp with lunches generally being picnic style and eaten in the field. At the end of the day students have dinner prior to their evening programs. Labs are designed to introduce students to the marine life they will observe in the field. Our instructors teach using a wide variety of live and preserved specimens that students are encouraged to handle and investigate. The topics of labs include invertebrates and fish adaptations. The students will also learn more about sharks with a lab on shark ecology prior to an excursion to La Jolla Shores for a Shark Snorkel. We also conduct water chemistry, plankton studies, physical oceanography and seining activities in the field. These allow students to directly apply the concepts of marine science to real-world observations. Participatory workshops such as deep-sea animals and night adaptations combine the learning with a fun nighttime activity. Students will have the opportunity to visit The Living Coast Discovery Center – located inside the San Diego Bay National Wildlife Refuge. Students will participate in a behind-the-scenes experience and a nature walk through the wetlands incorporating discussions on marine birds and reptiles. While at the Discover Center, students will have the chance to participate in a scavenger hunt. The activity will lead students through a variety of amazing exhibits, from local bird species at Shorebird Aviary and Raptor Row to the Turtle Lagoon. Prior to the visit to The Living Coast Discovery Center student will stand up paddle board and complete their Sea Turtle Biology and Conservation Workshop. In-water activities for the SEACAMP I week include kayaking, boogie boarding, stand up paddle boarding and snorkeling. Our sit-on-top kayaks allow students a great follow-up to a discussion of shallow bay ecology, in addition to learning some fun kayak games! Our instructors also introduce students to many aspects of physical oceanography. Students will experience first hand the waves Southern California is famous for while boogie boarding under the supervision of the SEACAMP San Diego staff. Students of all abilities have been very successful in mastering the skills of snorkeling through our progressive and well-supervised snorkeling program. We expose students to many different sites in the San Diego area, beginning with an introductory session at Mission Point. The highlight of the SEACAMP I week is the all day boat trip with snorkeling, marine life interaction and marine mammal watching. With time permitting the students will conduct an otter trawl and capture plankton for observation. Students have an opportunity to further improve their snorkeling skills on this trip aboard a 65-foot charter boat. While your student is here with us at SEACAMP San Diego, we are excited to give him or her an “unplugged” experience. Time away from the computer, TV, and personal cell phone use means more time for learning, interacting, and being out in the field and on the water. This unique unplugged experience allows your student to truly engage with other students and all of the activities he or she will be participating in. For most families, it is the parents who find it hardest to cut ties with their student during a camp session. Students are engaged with new activities, new friends and busy schedules – no news is good news! Parents may feel reassured to know that we will, of course, contact them if their child is having insurmountable difficulties or issues while at camp that are brought to the staff’s attention. As you will not be receiving phone calls from your student once they have arrived at camp, try to remember that not hearing from them or SEACAMP is a positive thing – this means your child is okay and having a great time! Your student can, however, receive messages from home while they are at SEACAMP. Email is a great way to let your student know you are thinking of them and keep them up to date on life at home – please refrain from sending photos, as we do our best to keep waste minimal. Send your email to camper@seacamp.com and include your student’s name in the subject line. Emails will be printed and delivered to camp once a day. As there is no internet at camp, campers will not be able respond. Please be aware that messages are sometimes scanned and those with inappropriate subject matter will not be delivered and may be forwarded to parent/guardian. SEACAMP does not accept mail or care packages for campers. However, if your student forgot an important item, please email or call the office and we will do our best to assist. SEACAMP San Diego staff have training and experience in dealing with students experiencing adjustment, social, or homesickness issues. Our staff will counsel students about their feelings and work together to find solutions to fit your child’s specific needs. Please remember calling home is sometimes the worst, not the best, remedy for homesick students. Be assured in the event of an emergency or needed communication SEACAMP Staff have cell phones and will contact you. The first day of camp can be particularly challenging for students. With this in mind, we have set-up several tasks for students to complete upon arrival. They will need to pick out and set up bunk space, meet the group leader for the session and pick out SEACAMP swag. The students all also make gear bags for their week with us. Additionally, we offer camp tours for students and parents that have driven their student. In our experience students make friends and integrate into camp more quickly and successfully once parents have departed. Prior to you students’ session be sure to discuss the importance of communicating with SEACAMP San Diego staff members. Instructors can only remedy ills we know about or witness; some students are quiet about their needs or problems. We try to hire a diverse staff so that even reserved students will be able to find someone they identify with and trust. Reinforce the importance of telling instructors about any questions or concerns your student may have while at camp. We are not able to help, if we are not aware of the issue. SEACAMP San Diego Marine Science Instructors possess at least a college degree and are certified Red Cross Lifeguards with First Aid and CPR for the Professional Rescuer including first aid for marine hazards. Additionally, all staff have been finger printed with the Department of Justice & FBI and all have Class-C commercial driver’s licenses. SEACAMP San Diego does not retain a nurse on staff, although we do have a paramedic consultant on call. We are within close proximity of emergency care and are in a 9-1-1 service area. Students also attending SEACAMP II will complete additional forms. Boat Release Form – Release for Horizon Charters for live-aboard boat trip, required for each student. Form is included within the Registration Forms. SCUBA Form (optional) – Optional for students participating in SCUBA Program that are 14 years or older and certified SCUBA divers. Form included within the Registration Forms. Forms must be submitted by May 15th to participate in SCUBA Program.